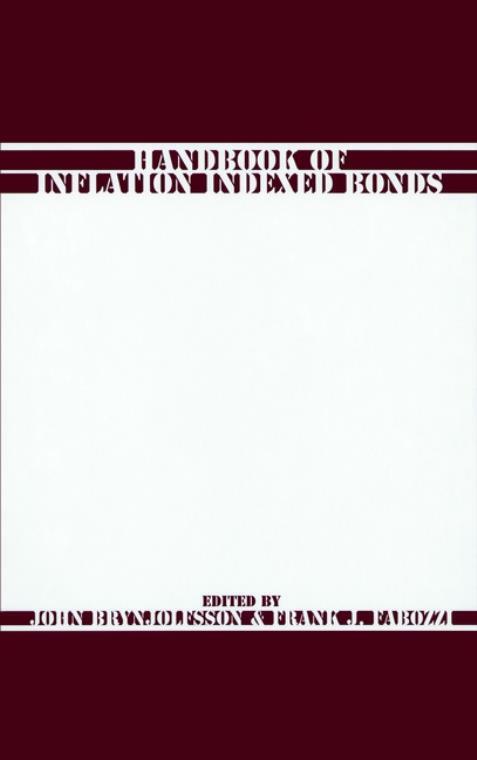 Handbook of Inflation Indexed Bonds provides complete coverage of inflation protection bonds beginning with their first U.S. issuance in 1997. Five, in–depth sections detail: strategic asset allocation; mechanics, valuation, and risk monitoring; global environment; issuers; and investors. 1. Introduction (J. Brynjolfsson and F. Fabozzi). SECTION I: STRATEGIC ASSET ALLOCATION. 2. Musings About Real Asset Allocation (J. Brynjolfsson). 3. Shifting the Efficient Frontier with Inflation–Indexed Bonds (R. Dalio and D. Bernstein). 4. Using Inflation–Indexed Securities for Retirement Savings and Income: The TIAA–CREF Experience (P. Hammond). 5. Recognizing and Achieving Strategic Investment Goals (B. Moore). 6. Inflation Hedging in a Low–Inflation World: The Plan Sponsor′s Rationale (L. Siegel). 7. Asset Allocation with TIPS (J. Brynjolfsson and E. Rennie). SECTION II: MECHANICS, VALUATION, AND RISK MONITORING. 8. Quantitative Approaches to Inflation–Indexed Bonds (W. Phoa). 9. Valuing and Trading TIPS (G. Lucas and T. Quek). 10. Understanding the CPI (W. Kan). SECTION III: GLOBAL ENVIRONMENT: PAST AND PRESENT. 12. The U.K. Experience (M. Deacon). 13. The Australian Experience (M. Chadwick). 14. The Canadian Experience (K. Basta and M. Klaponski). 15. The U.S. Experience (R. Anderson). 16. The French Experience (C. O′Hagan). 17. Arguments for Issuing Linkers (W. Lloyd). 18. Corporate and Agency Inflation–Linked Securities (A. Rosen, et al.). 19. The Individual Investor and Inflation–Indexed Bonds: Tax Issues and Retirement Planning (C. Kinney). 20. Inflation Indexed Products for Stable Value Funds (D. LeRoux and V. Gallo). 21. Inflation Protection Bonds and Endowment or Foundation Investment Policy (W. Schneider). 22. Foundation Applications (A. Heuberger).